A 184ft (56m) sculpture was officially unveiled on Wednesday in Manchester by Olympic sprinter Linford Christie. The "B of the Bang" - designed to look like an exploding firework - was lifted into place near the City of Manchester Stadium in August 2004. Its starburst finish was inspired by Christie's claim he always left the starting block on the "B of the bang". The sculpture caused a scare last week when one of the 7ft (2.1m) spikes fell to the floor. The sculpture - which cost £4m - is made up of 200 solid steel columns. 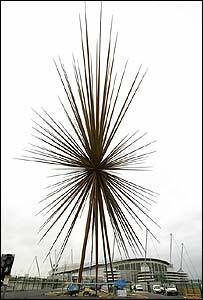 Affectionately known locally as Kerplunk - because of its resemblance to the popular 1970s children's game - it is a tribute to the 2002 Commonwealth Games which were hosted at the nearby stadium. The B of the Bang is funded by the North West Development Agency and the European Regional Development Fund, and was designed by Thomas Heatherwick.